The Envirotrak cellular paving system enables the fast and efficient implementation of ground reinforcement and stabilisation. Manufactured in the UK and Europe and made from 100% recycled high density polyethylene the cellular design of the grids allows the dispersion of excess rain or flood water which makes it ideal for integration with Sustainable Urban Drainage Systems (SUDS) and in areas prone to flooding or with water dispersion problems. 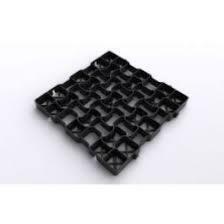 The grids can be easily cut to form shapes around obstacles such as planters or posts. 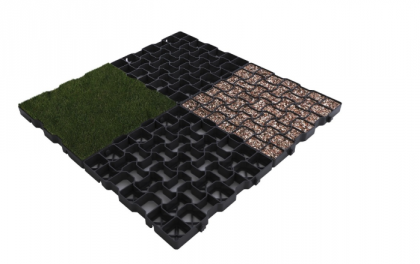 Envirotrak can be filled with grass or gravel - When used with top soil and seed a 95% grass covering is provided, giving an aesthetically pleasing natural finish. Alternatively gravel can be used giving a robust and stable base with fast water dispersion, whilst reducing the loss of expensive gravel and preventing rutting and movement.